Super Savings Item! Save 37% on the Aramco Alpine Gourmet Dutch Oven, 2 quart, Stainless Steel by Aramco at Baking Love. MPN: BK-201-4. Hurry! Limited time offer. Offer valid only while supplies last. Stainless Steel Dutch Oven 2QT - Enticing soups, rich sauces, mouthwatering seafood and perfect pasta are all great reasons to need a stockpot. Stainless Steel Dutch Oven 2QT - Enticing soups, rich sauces, mouthwatering seafood and perfect pasta are all great reasons to need a stockpot. 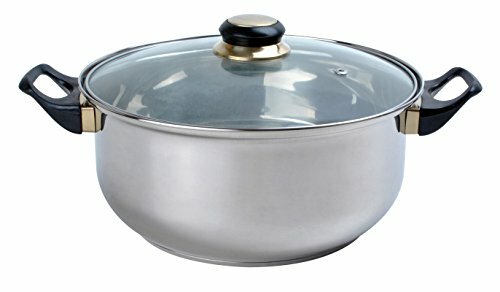 Versatile and necessary, this Dutch oven comes in handy for all your cooking needs and its size is perfect for any use. The pot is constructed of stainless steel and its lid helps to keep moisture in, preventing vitamins and the flavors of the foods from getting out. Visually, this professional looking cookware will go nicely many different kitchen styles.